Description: The engineer for the 428 walks to his cab after checking on the second locomotive. The fog was extremely thick that afternoon and evening. Description: There was a little confusion pulling into the yard at Barstow about which track we were to go onto, that could have been a big mess with that fog that night. Description: The lights from the locomotive light up the fog as we wait to get a warrant from the IC&E. Description: The brakeman spins the hand brake releasing the brakes on that string of cars just before we pick them up. Description: This was the view as we crossed the Mississippi River on the Crescent Bridge. You could only see about 100ft after the fog continued to thicken. Description: Riding through the IAIS's Rock Island yard, you can see former CRI&P station in Rock Island in the fog. Description: The fog creates ghostly images just after we came off of the Crescent Bridge in Rock Island. Description: Just before crossing Rt. 5 the crossing gates appear. Description: BNSF transfer rolls into CN's Johnston Yard on the city wye. Description: Transferring some freight out of the Tennessee Yard, this trio is seen in the Lamar and Winchester area. Description: Three ex-Burlington Northern engines pass by me too fast. Description: Local transfers freight out of the Tennessee Yard to the south. Description: BNSF's transfer to CN's Johnston Yard heads back to TY Yard with inerchange traffic. Description: BNSF 1535 is pushing Frisco 4500. Description: Amtrak P42DC #82 was built in 1997 as part of order #1430 for 98 units. 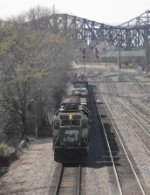 The BNSF transfer is pulling into the downtown interchange yard, with the west switch located at 31st Street.